Jiayin Xie is a rising senior at Wilbert Tucker Woodson High School in Fairfax, VA. She enjoys solving mathematical puzzles in and out of school. In addition, she spends an unusually large amount of time playing clarinet for various reasons that she does not yet understand. Jiayin's favorite subjects include mathematics, physics, and history. In her spare time, Jiayin enjoys dabbling in the melange of instruments that she owns and contemplating the mysteries of life. 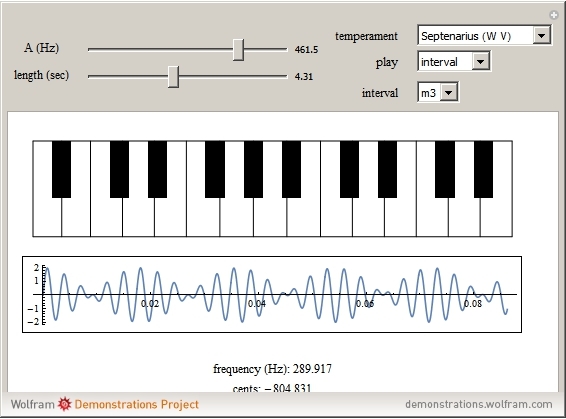 This Demonstration allows the user to experiment with some of the most common temperaments for tuning. Equal temperament is commonly found on pianos today, but this was not the case in the past. Every temperament has unique characteristics that can be tested here. All the temperaments here were tuned from A4. The user both listens to and visualizes the pitches played.